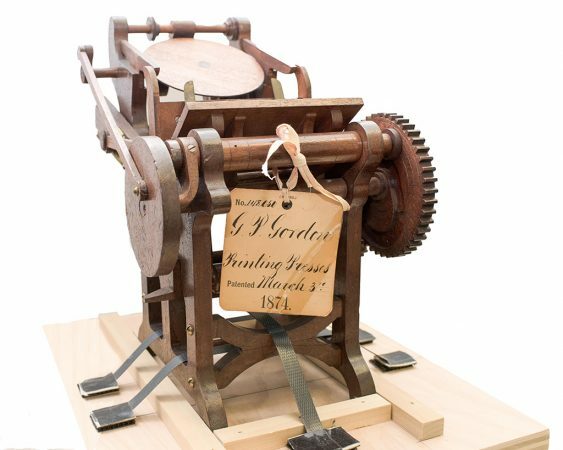 On Wednesday, March 15, 2017, Frank Romano, President of the Museum of Printing in Haverhill, Massachusetts, visited the Government Publishing Office in Washington to transport an 1874 U.S patent model of a platen printing press which GPO is lending to the museum. APHA’s Chesapeake Chapter sponsored a “going-away party” in GPO’s Visitor Center at which GPO Director Davita Vance-Cooks and Deputy Director James Bradley formally turned over the model to Romano. The model was prepared for transport to the museum by cabinetmaker John Beckel of the GPO Carpenter Shop, who constructed a specially fitted case for the model to travel in. Between 1790 and 1880, the U.S. Patent Office required all applications to include a functional model as an illustration. Models were originally displayed in an exhibition space in the Patent Office. The requirement was abandoned in 1880. A fire in the late 1870s claimed a great many of the models, and in 1925 most of the remaining collection was sold to a single buyer, who intended to establish a museum, but failed to do so. Many of those remaining models found their way into the market, and the model for patent 148050 eventually found its way to GPO. GPO used many platen job presses over its history. Inventories from the early twentieth century show 15 to 20 platen presses in use in the job shop alone. When GPO’s shift to offset printing became complete in the 1980s, the last of the platen presses edged into GPO history. 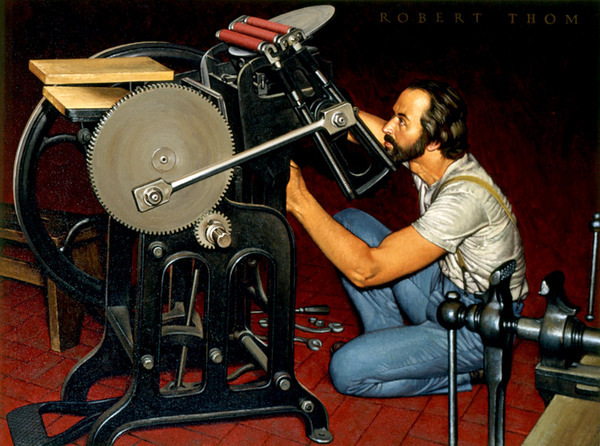 Robert A. Thom, “George P. Gordon and the Platen Press”, oil on canvas, 33 × 25 inches, Kimberly Clark Graphic Communications Through the Ages Series, ca. 1960. A little clarification: The original Robert A. Thom paintings in the Kimberly Clark Graphic Communications Through the Ages series are in the Cary Collection at RIT. and the link above takes you to information about the series. The Museum of Printing holds reproductions. 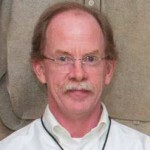 Stephen P. Ruggles developed the first practical platen press. Thanks, Stephen, I stand happily and gratefully corrected. It should be mentioned — because of his heroic efforts — that the ‘single buyer’ who purchased (saving them from destruction), preserved, and later auctioned thousands of Patent models was O. Rundle Gilbert, the notable auctioner. It should also be mentioned — to conceptualize the size of the model — that the attached tag measures 2-3/4 inches x 3 inches.